Unitus Ventures (formerly Unitus Seed Fund) makes seed-stage venture investments in “BoP startups” … startups that serve large, low-income populations. Our portfolio companies create opportunities for economic self-reliance, education, healthcare, and obtaining necessities for the 1 billion people in India living at the base of the economic pyramid (BoP). While we’re a financials-first investor, we are wholly-committed to investing in companies producing sustainable social impact. The following articles will help investors seeking such social impact understand the global state of impact investing and Unitus Ventures (formerly Unitus Seed Fund)’s perspectives on various topics in the impact investing sector. Opportunities to do well while doing good. How “impact investing” is different from philanthropy. What is the definition of BoP (base of the economic pyramid) persons in India? Should Impact Investors be Worried about a Devalued Rupee? 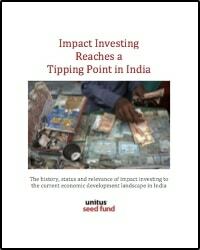 Who are the impact investors in India?